I bought this radio for Jenny as a Christmas present. It's excellent. Didn't have to crack open a manual to get it to work which is always a good sign. It autoconfigured itself and easy to use. The reception is crystal clear and there's lots of stations to choose from. Good-bye FM; hello DAB! 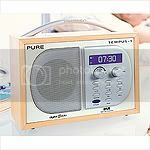 The radio also includes digital output and you can upgrade the firmware via a USB connection. Turns out the product is based on the Frontier Silicon Chorus FS1010 processor. It's an entire platform on a chip with 150Mhz DSP, 384K RAM and a load of onchip peripherals. Kind of bizarre to know your radio runs four threads!